The only definitive guide to customer loyalty, its diagnosis, management, and improvement available to the telecommunications professional. Industry veteran, Rob Mattison, shares his expertise. If there were one book you could use to help understand and develop telecom churn management programs, this is the best choice. The book explains tools and techniques for a coherent telecom business strategy in an era of competition and for marketing to customers based on the deep understanding of those customers’ needs and motivations. It is a very readable text that communicates the core ideas effectively. 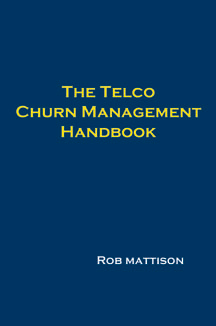 Highly recommended for telecom execs and for those suppliers who would understand the telecom provider as a customer. To download a free copy of this book... CLICK HERE. The book provides the telecommunications I/T professional with a comprehensive guide to understanding how these approaches can help drive immediate and pronounced business value. Through dozens of case studies and real-world examples, this clearly written guide shows telecommunications managers how to build more effective data warehouses without wasting time and money on impractical untenable approaches. The book provides practical step-by-step instructions on how to engineer and implement a warehouse/mining strategy that reduces costs, maximizes profits, and supports long-terms corporate goals. This book arms the telecommunications marketing, sales, and customer care professionals with detailed instructions for making use of customer databases to accomplish their objectives. It teaches telecommunications companies how to develop a competitive marketing process and how to utilize database marketing to gain and maintain relationships with profitable customers. It discusses organization strategies, how to use billing systems and call information, and how to make use of marketing media, including direct marketing. It accents these lessons with examples of successful telecom marketing campaigns to highlight ways to increase and keep a strong customer base. It demonstrates how to make the best use of marketing technology and to organize the marketing department to perform at its highest level. The book provides practical advise on key roles of team formation, modeling, campaign planning, statistical analysis, and how to best use available marketing media. The Animated Telecom Dictionary (ATD) is the first technical dictionary that uses animation diagrams that are included on a fully readable CD-Rom to help explain the new complex technologies. The book explains the latest telecommunication technologies and provides a reference for industry terms. It covers wireless, wired, and information telecommunications systems and services. It is perfect for almost all telecommunication experts as it contains the latest definitions and market information, along with definitions of essential industry terms and acronyms.